Among a host of exceptional new features, models in the IDEAL from Massey Ferguson line-up offer the biggest integral grain-tank capacity now available on the European market, the fastest unloading rate and the largest threshing area – all focused on delivering significant gains in efficiency and output. 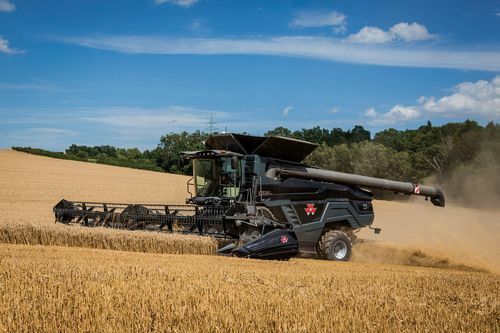 “Built at AGCO’s European Harvesting Centre of Excellence in Breganze, Italy, the MF IDEAL range signals a radical new direction for our combine development,” says Adam Sherriff, Market Development Manager, Massey Ferguson Harvesting, Europe and Middle East. “Utilising the full force of parent company AGCO’s global resources, this is the biggest new harvesting product development project we have ever undertaken. It included production of 45 prototypes and six years of continuous lab and global field tests measuring performance in all crops and conditions. Everything about the machines is new – new design, new engineering, new features, new styling, even a brand-new livery in stunning graphite. Added to this, the 647hp MF IDEAL 9 represents a totally new market segment for Massey Ferguson.” “The impetus behind the R&D programme, which was based on our extensive ‘Voice of the Customer’ surveys, was to ensure that we created real business benefits for combine owners and operators, making a positive contribution to their profitability. Our focus was on fully-addressing their key concerns in areas such as fuel-efficiency, performance, serviceability, ease-of-repair, grain quality, residue management, transport width, data management, hillside working and soil compaction. Underpinned by Massey Ferguson’s design principles of efficiency, ease-of-use, simplicity and no-nonsense dependability, our IDEAL from Massey Ferguson Combines offer major benefits in all these areas and more,” Adam explains. The multitude of business benefits designed into the new IDEAL from Massey Ferguson Combines include, for example, a focus on improved fuel efficiency. 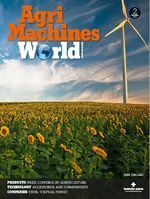 “In this area, we have concentrated on ensuring that all the combine’s features make low demands on power,” outlines Adam Sherriff. “We have designed simple drives and incorporated a low belt count – just 13 in all. The Dual Helix threshing system uses low pressure rotors which are designed to allow maximum space around each rotor for the straw to expand and release grain. The length of travel and the fact that the straw falls by gravity directly into the chopper really keeps the power requirement to a minimum by not breaking up the straw. The length of the rotor and the extensive 1.66m² threshing area also allows high outputs with low grain loss.” Grain quality benefits from the MF IDEAL’s low compression and extra-long rotors, which are gentle on straw, thus avoiding contamination of the sample. With the IDEAL balance under-rotor pans making pre-separation longer, they ease the job of the sieve box and fan to create a clean grain sample at high output. In addition, within the tank and unloader system, despite having the fastest unloading auger in the business, the flight pitch is designed to minimise damage to grain while optimising flow. All these features come together to make the final product as clean and as high quality as possible leading to less grain processing and helping to achieve better prices.